The proximity to the Atlantic was wonderful as we could listen to the ocean or watch the waves from our balcony! Brilliant location, friendly helpful staff. Overall cannot be faulted. Superb accommodation, clean, spacious, lovely view of the beach, well equipped, super helpful staff to book excursions and advise on local amenities, nice local supermarket and reasonably priced places to eat. We couldn't recommend more highly. The location is amazing! The property is located almost at the beach on the main promenade and it is still very quiet - you can hear only the sound of the ocean. The property looks exactly the same as on the pictures and every aspect matches the description. The personel is kind and helpful. A lot of free parking space on the street in the afternoon and in the evening - when you're back form the sightseeing, you can park right next to the main entrance. Gorgeous location, installations, comfort and kindness of the staff. A place and a hotel to return. Perfect location and despite being immediately next to a very popular beach and promenade, it was really quite peaceful! Clean as a whistle and it was the little things like provision of a cloth, tea towel and hand towel in the kitchen that made all the difference, albeit all we used were cups for coffee. Cool box and ice blocks were particularly welcome. We would highly recommend these apartments. From the minute we arrived, we loved it every thing was ready even we arrived early we good check in. The reception staff are excellent, they helped us a lot with booking trips and always friendly. The apartment exceeded our expectation it was so clean and everything we needed were there. It was just wonderful . I will definitely recommend this to my friends. Lovely apartment, very clean, comfortable & had everything we needed & a perfect location. Wonderful location , central and on the beach. We ordered the drinks and tapa's hamper and was surprised by how much we received a wonderful selection of locale specialities. Friendly staff and very comfortable apartment with everything you could require. Lock in a great price for Luz Beach Apartments - rated 8.9 by recent guests. One of our top picks in Luz.Located beachfront in Praia da Luz, the Luz Beach Apartments offer self-catering accommodation less than 1-minute walk to the beach over a traffic free promenade. Free WiFi is available in all apartments. Luz Beach Apartments comprises of two rows of apartments right in front of the beach. The Sea Front apartments are on the front row and have uninterrupted beach and sea views. The Sea View apartments are located along the back row and overlook the sea from above. All apartments except the Ground Floor Lighthouse Studio have furnished balconies with sea views. The Lighthouse studio has no sea or beach views as in on the ground floor and adapted for those with mobility issues. Instead there is a small walled courtyard with outside dining. Several restaurants, cafés and bars serving local and international cuisine are within a 2-minute walk away from the Luz Beach Apartments. The bus stop and taxi rank are a short walk away as are the supermarkets, pharmacy and bank. Guests can relax on the south facing terrace, head down to the beach with the beach picnic cooler box, beach parasol and body surf board all provided free of charge, choose a book from the library or take a cliff top walk. Other activities include dolphin safari trips, grotto cave trips, kayaking, water parks, surf lessons, jeep safaris, deep-sea fishing and golf. For babies 2 years and under, there are free travel cots, high chairs and stair guards. There is a communal children's toy box full of beach toys for all children to use whilst on holiday at The Luz Beach Apartments. Sofa beds and children's fold away beds are available at an extra charge. Free public parking is available in front of the apartment complex. This is our guests' favourite part of Luz, according to independent reviews. This property also has one of the best-rated locations in Luz! Guests are happier about it compared to other properties in the area. Luz Beach Apartments has been welcoming Booking.com guests since 18 Jun 2010. When would you like to stay at Luz Beach Apartments? Well equipped and spacious self-catering sea view apartment located along the second row with 2 floors linked via a wooden spiral staircase. It is quieter and offers higher views over the seaside from the upstairs balcony. Ideal for couples and especially families. Comfortable seating room, dining table and chairs, sea-facing balcony and kitchenette all on the first floor. Downstairs a large double bedroom with twin or king size bed, private bathroom and a private walled terrace with outside dining area, sunbeds and a hammock. Free travel cot. Up to 3 fold-away beds for children under the age of 12 or 2 single sofa beds suitable for older children or adults. Extra charges apply. 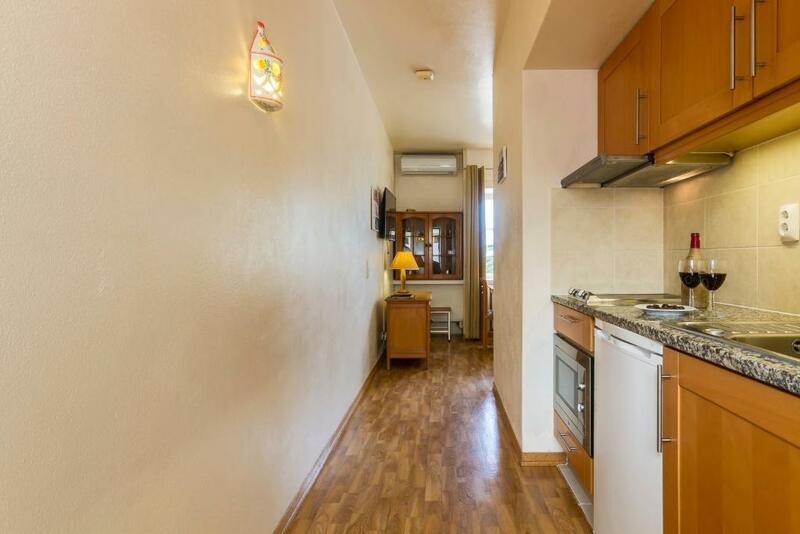 This apartment is not situated on the sea front but on the row behind. The apartment has sea views from both upstairs balconies and is under a 1-minute walk from the beach. A unique and spacious 2-bedroom split level family apartment overlooking the sea and beach. Ideal for larger families, families with young children or teenagers or two couples that want that extra space. Comfortable seating room, dining table and chairs, 2 sea-facing balconies, kitchenette, twin bedroom and private bathroom all on the first floor. Downstairs via a wooden spiral stairway, a large double bedroom with twin or king-size bed plus a second private bathroom. Two child-friendly balconies both with sea views, a ground floor walled terrace with sun chairs, outside dining and hammock. Free travel cots available. Not suitable for those with mobility issues due to the spiral staircase. Well equipped and spacious self-catering apartment on 2 floors with uninterrupted views of the beach and sea. This apartment is on the beachfront. Ideal for couples or families with a child under the age of 12. Comfortable seating room, dining table and chairs, sea-facing balcony and kitchenette on the entrance level. Downstairs via a wooden spiral staircase, a large double bedroom with twin or king size bed, private bathroom and a private walled terrace with sun chairs, outside dining area and a hammock. Free travel cot. One fold-away bed for one child under the age of 12 at an extra charge. Not suitable for those with mobility issues due to the spiral staircase. Sea Front Studio with uninterrupted beach and sea views ideal for couples. This cozy studio consists of an entrance hall, well-equipped kitchenette, a dining/seating area with 2 comfortable armchairs, views over the beach, south facing terrace with terrace furniture, a sleeping area with choice of twin or king size bed and full bathroom. This studio is suitable for guests with limited mobility. 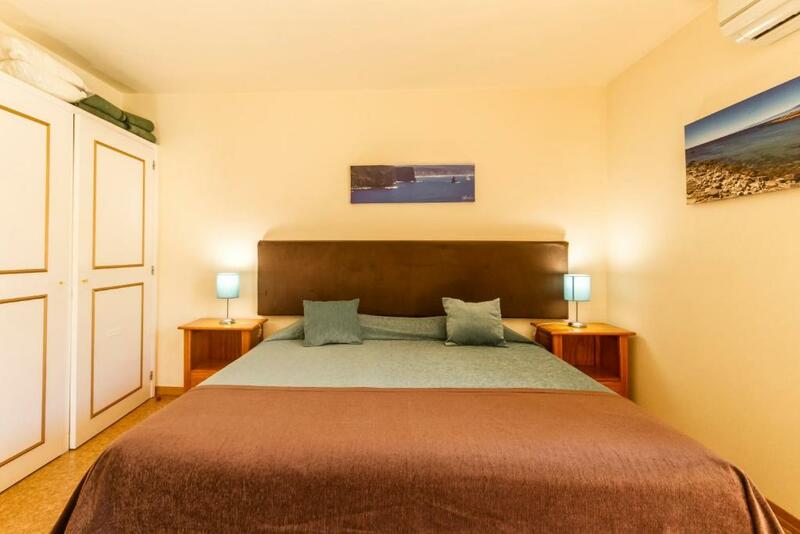 Well equipped self-catering studio overlooking the beach and sea. Located on the first floor up a flight of stairs (no lift) with a private entrance and lovely views. Perfect for younger couples or solo travelers. Bright 'hide-away' studio, with kitchenette, dining area, standard double bed, private shower room with WC and wash basin. Balcony with our-door furniture plus private terrace with sun chairs and a hammock. Not suitable for those with mobility issues due to the staircase and no lift. This 2-bedroom apartment comes with two south facing balconies. The apartment is located on the top floor of a 2-storey building, 200 meters behind the beach and the main reception and accessed by three flights of stairs. There are two bedrooms consisting of a double bedroom and a twin bedroom. Shared bathroom with bath/shower. Fully fitted open-plan kitchen and comfy living room with large sofa and armchair, plus dining table for 4. This apartment is not recommended for those with mobility issues or families with buggies due to the stairs. Known as the Lighthouse Studio, this unit is suitable for guests with limited mobility. It does not have sea or beach views. Due to being on the ground floor, it has an independent entrance with a private walled courtyard with outside dining area and hammock. There is a kitchenette, dining area, arm-chair, double bed and private roll-in/walk-in shower room. It is a 1-minute walk from the beach. Location, location, location! If you wish to wake up to the sounds of the sea with the beach at your doorstep then look no further! No passing traffic, no need for a car and all village amenities within a 10 minute stroll. Unique! Choose a sea front studio if you have mobility issues as these are all on one floor and right on the sea front. Otherwise our one bedroom sea front apartments are literally just that - right on the sea front with uninterrupted sea and beach views. and perfect for those wanting a bit more space with a separate bedroom down a flight of stairs. Situated the row behind these are our one bedroom sea view apartments, again with a separate bedroom linked to the living area by a spiral staircase. The one bedroom sea view apartments are NOT on the sea front but the row behind so please bear this in mind when booking! However they all have sea views from the upstairs living areas. House rules Luz Beach Apartments takes special requests - add in the next step! Up to three children under 12 years are charged EUR 20 per night when using existing beds. Luz Beach Apartments accepts these cards and reserves the right to temporarily hold an amount prior to arrival. Guests must be quiet between 00:00 and 06:00. The Luz Beach Apartments provide linen and bath towels. Beach towels can be bought at the reception. There is a weekly apartment cleaning and linen change, plus a mid-stay towel change. The one and two bedroom apartments are split-level, linked by a spiral staircase. Guests with limited mobility are advised to book the Sea Front Studios or The Lighthouse Ground Floor Studio, which has been designed especially for those with mobility issues. The reception is open 09:30 - 13:00 and 14:00 - 18:00 Monday to Friday and 10:00 - 13:00 on Saturdays. Times vary out of the high season. It is important for guests arriving outside reception opening times to read the arrival information supplied by The Luz Beach Apartments on how to access their accommodation. Please inform Luz Beach Apartments in advance of your expected arrival time. You can use the Special Requests box when booking, or contact the property directly with the contact details provided in your confirmation. It was exactly what we wanted for a week. We thought we were in front row apartments with unobstructed beach view. Instead we were in second row with view over the roof. I should have been more careful but I don't feel this was made particularly clear when booking so take care that you know what you're getting to avoid disappointment on arrival. All aspects. We feel at home. Cleaning only once in 4 days, so also the change of the towels, soap, schampoo and others... Not critical, but... In one bedroom apprts the AC only in the bedroom, not in the living room. Once again not critical, but... In 2 bedroom apparts AC in each bedroom and also in the living room. All others - perfect location, quite, spacious.